Adele L. Piacentini, 96, of Cranston, passed peacefully Friday (1/16/2015). She was born in Providence a daughter of the late Adelard and Ida (Plante) Goulet. With their early deaths she was raised by Ida's Sister She was theand husband Louis and Antoinette (Plante) Pickering. 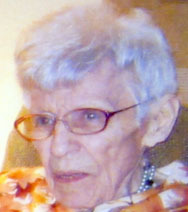 She was the wife of the late John Joseph Piacentini until his passing in 2001. She leaves a son, Rev. David A. Piacentini of Providence, 2 daughters; Marylou Swanson of Coventry and Ann-Marie Kournpates of Warwick, three grandchildren; Scott Kournpates, Joshua and Erik Swanson and 2 great grandchildren Paxton and Keegan Swanson. She was sister of the late Albert, David and Wilfred Goulet, Florence Armstrong, Blanch Spearman, Mildred Brown, Doris Perry and Gloria Perry. Her life will be celebrated Wednesday January 21, from 3 - 6pm in the Stapleton Family Funeral Home, 684 Park Avenue, Cranston, RI. A Mass of Christian Burial will be celebrated Friday at Saint Matthew Church, 15 Frances St. Cranston, RI at 10 am. Burial will be at Saint Ann Cemetery, 72 Church Street, Cranston, RI.